Have you ever thought of hiring a life coach? Have you ever wondered what you could achieve if you had an accountability partner? Maybe you’ve tried the novel approach to creating different results than the trajectory you are on right now. If you are self-motivated at all, this book could be the recipe for positive momentum in finding what works for you. One glance at the book cover should clue you in to what the author thinks of work-life balance. 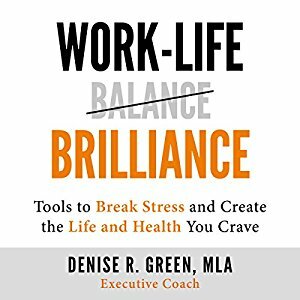 In fact, the title of the book is, Work-Life Balance Brilliance and isn’t that really what we want from our lives and from our work? This book, with the chapters listed above, can best be described as a tool for knowing yourself and understanding inspirations and aspirations within and how your relationships and interactions are key in creating brilliance. The author identifies the four realms of Whole Life Integrations which she calls Brillance. Then through stories and instructive dialog, she coaches you through the steps to create that work-like brilliance. I am a huge advocate of being careful with thoughts because thoughts drive actions. I was impressed with the content of the chapter, Tame Your Thoughts. Green doesn’t just rely on dialog to teach the methods of controlling thought. She offers a 6-step upgrade tool that I would call guided self-reflection. Then she offers advice on how to make your release from negative thoughts really stick. Some strong points of this book are in the toolkits integrated with each chapter. Story is interesting, and case studies are evidence that somewhere along the line the principles taught in the book worked for someone. All you have to do is read through some of the action items to know that, if put into practice, many of your niggling aspirations could become your reality. By implementing some of the basic ideas suggested could bolster your confidence and give you an edge toward balance which you will redefine as brilliance. You don’t have to change everything. The changes will be dictated by what you discover about yourself and about relationships as you work through the pages of the book and guidance received by using the focus-inciting questions. When I read a book like this one, I have a tendency to choose a favorite chapter. Manage Your Relationship With “Stuff” was a surprise. It is a powerful game-changer. Rarely have I read a book like this one that so aptly presents the tethers that hold us back like our ‘stuff’. Denise Green points out that we have two limitations that are huge. Time – we get 24 hours every day. Period. Physical – we operate with imperfect bodies that need to be taken care of – sleep is one thing most of us need more of. Note: we get 24 hours every day. Period. The author remarks that “This Brilliance realm (relationship with stuff) includes our relationship to our spaces, possessions, technology, and time.” Certainly, every reader can identify with the components we all deal with every day and how we allow them to affect our world makes this book invaluable to creating a brilliant life. Do you need ideas for managing your time, designing a winning pattern for your day, working productively in your environment, managing technology? How about reducing your exposure to toxic energy? The toolkit consists of worksheets to help you replace those components that are not serving you. Remember sleep? Some of us are more familiar with the lack of it. The chapter titled Brilliant Sleep is – well – brilliant. Whether you suffer from legitimate insomnia or sleep deprivation brought on by environmental or physical or activity conditions, the best practices for sleep hygiene in this chapter are priceless. Yes, we all know the trick of going to bed at the same time every night and getting up at the same time every day. We know to restrict caffeine in the afternoon. We might, on the advice of a physician, take melatonin. We might invest in a book that sends us to sleep because it provides absolutely no spark of interest. If you want to sleep and have forgotten what it feels like to get adequate sleep, you aren’t alone. The tips in this book are plentiful. The final chapters of the book are based on putting legs on what you learned in the first part of the book. What do you want to change? What goals do you have? Are they the right goals for how you envision your work-life brilliance future? I remember hearing someone say that we invest ten months planning a two-week vacation and about ten minutes planning our future existence. That’s probably not truly accurate, but isn’t it true that we have goals, but may not know if they are the right goals until we get there and realize they aren’t? There is no magic, but if you’re looking for help in reinventing your life, this book can bring magical results.